For the past seven years, Late Night District have been grinding away in San Jose’s local music scene—but haven’t ventured much further than the Bay Area. Until now. Formed by vocalist/guitarist Mark Shriver, the band delivers a high-energy brand of indie-rock, and on Tuesday, Dec. 12, they will play Oregon for the first time, at Johnny B’s in Medford. “I’ll just quit,” adds bassist Kyle Visco. 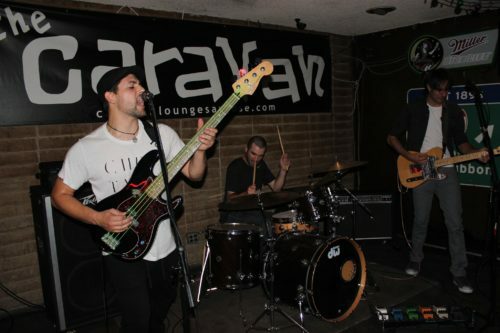 The band first started to come together when Shriver met bassist Kyle Visco. After that meeting, the two set out to find a drummer. They had both heard of local drummer Travis Drumm, and actually met him through a chance encounter. Their impromptu jam session that night at the bar, was enough to convince Drumm to join the band. Shriver has been playing in various bands for years and wants the band to be successful. But having a good time is more important than musical ambition. Shriver and Visco are excited for their first tour, and what the future has in store for the band. But they are experienced enough to remain level-headed and realistic.